So, it’s spring – which means that exam season is impending, and if you’re anything like me, it means you’ll get tired of studying day-in-day-out in the same place. So, me being me, I’ll naturally travel to my second home: Starbucks. But wait – it’s no longer cold and christmassy. You no longer crave toasty lattes filled with festive flavours. Instead, you want iced lattes, cool refresha’s and sugary frappucinos. But there’s so much choice and so many drinks – how will you pick one? 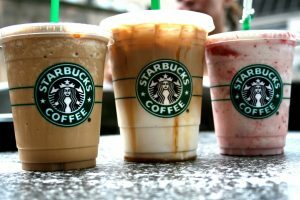 Well, I’m going to help you, by giving you a list of my favourite spring/summer drinks from Starbucks. This is the perfect drink to bridge the gap between winter and spring, when you still want winter spices and flavours but are craving something sweeter and colder. This combination of chai spices and a white mocha in a frappucino combine wonderfully into what is reminiscent of cinnabon. It really tastes like you’re drinking a sugary rich cinnamon bun, topped with a glorious cream cheese frosting. Honestly, this is a classic that you can have all year round, but for me, it definitely signals the advent of warmer seasons when I trade in my caramel latte for a caramel frappucino. Iconic and simple, the caramel frappucino blends coffee, caramel and ice for that nostalgic taste of Starbucks, that made you go back the first time you tried it. I can never go too long without having one of these and the caramel frappucino is the perfect antidote to a hot day when you feel like you might need to push the laziness aside. This drink is such a hidden gem – it’s so often overlooked but I absolutely love it and look forward to it every summer. It is generally the most cooling and refreshing drink you will ever have, somewhat a mix between a mojito and soft drink, paired with the perfect amount of sweetness and summery tones, leaving you refreshed and thirsty for more. Also, it has green coffee extract, to energize without any of the calories. However, one thing I’ve noticed over time is that the water can sometimes dilute the flavour too much, so by switching the water with lemonade you ensure that you get only cool limey goodness. Also, there’s so much ice in these drinks that you get more ice than drink, so I always ask for it without ice so I’m getting a full glass of refresher – the lemonade is refrigerated thus keeps the drink cold. This tastes like a cross between a solero, pina colada, and general tropically goodness. Perfect for the days when the sun is boundless and your dreaming of somewhere with crystalline waters and hanging palms. This drink just screams exotic when you drink it and tastes exactly like that. The coconut milk is creamy and really adds that exotic edge to the florally sweetness of the mango. Creamy, cooling and fruity, this is perfect for sitting down with some reading that needs to be done. This was also something I stumbled across by accident, through experimentation, and instantly fell in love with it. Essentially it’s an Iced Chai Latte, but with the milk swapped out for vanilla cream, and let me tell you, it is glorious. The cream is thicker than milk, making for a feeling and taste of luxury as you sip it, and the gold chai spices, laden with subtle and sweet vanilla, is an explosion for your tastebuds. It’s almost too perfect for the summer – definitely something to drink when working on an essay or essay plan – but be warned, it won’t last long! Make sure to order a venti. A Classic. It’s the only way to describe this drink. It’s the iconic pike place blend, in the original ‘caramelXcoffee’ Starbucks combination – but over ice. It will bring back all the nostalgia of discovering Starbucks, along with the satisfaction of the OG Starbucks drink, but in a refreshing icy concoction. If you can’t decide what to drink, or don’t want something with frills and bells, then this is it; For the day you want a Starbucks detox; something simple and delicious. The Iced Caramel Latte is not only the answer to your cravings, but also most of the problems in your life. If anything can fix it, this drink can. So as you can see, picking a drink to study with this spring or summer, is a challenge, but hopefully, I’ve made the choice a little easier for you. Any of these wonderful drinks will keep you energized and going as you power through revision, whilst making the whole process a little more bearable. Any of these drinks will be perfect during a revision study session at Starbucks, so be sure to go to your local Starbucks and check them out. What’s great is that we have a Starbucks right on campus, so head on down and try some of these refreshing beverages today!